Behold the latest in Second Life user-created content: the high-tech startup business plan. With a community so large and competition so potentially fierce, it isn’t enough anymore to create a cool thing and hope it catches on through mere word of mouth. No, you also want to do some advance consumer research, and when you’re about ready to launch your product, create a solid distribution and marketing strategy. At least that’s the lesson I gleaned from a demo of Timeless Prototype’s Multi Gadget, a kind of nuclear-powered PDA utility that clips onto your ear, and comes with over 60 unique commands-- sort of an in-world Swiss army knife for just about every experiential aspect of Second Life. For futuristic combat roleplay, say, there’s a tear gas canister that knocks everyone in the vicinity in all directions, and an instant jail that materializes around the owner; for builders, there's several varieties of insta-bridge which appear at your feet, at a single-word request; for scripters, an “I’m busy scripting” thought bubble that appears above your head, so you can work in peace; for general fun, a giant lightshow that materializes in a single-word command. And so on. Pretty cool, all told. But what really impressed me was Timeless’ business plan for the Multi Gadget, the end result of a year researching the market, and what worked within it. 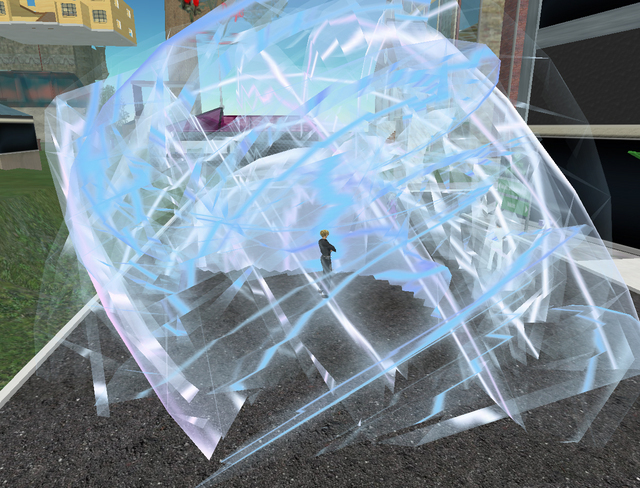 “Basically I've been exploring various business models in SL since I joined,” he explains. In the beginning, “I actually paid people to bring knowledge to me… it was a general request for information. When it came back to me, I would assess the usefulness of it and tip accordingly.” So when someone clued him in on a new club, for example, he spotted them with an L$ kicker. With enough of this informal research, he continues, “it did give me a feel for the community and the big players in it. When it comes to human networking it's important, because each person is a potential partner or facilitator.” In the process, he realized this was a monetizable activity on its own. “Information gathering in itself can be useful as a business,” he says. “[F]or examples, take a look at private investigation and market research,” Prototype observes. His next move was informed by a larger social observation. Some time away led to new thinking, and a new strategy. Because the retail system is about as important as the product itself. Timeless sells the Multi Gadget at an incremental discount (the larger the unit buy, the lower the wholesale cost), so prospective retailers can purchase and resell at a decent mark-up. “The pricing allows the retailer to sell the product for much less than I sell via direct sales, and yet still take a profit. This immediately empowers the retailers,” Timeless tells me. (The wholesale units even comes with a helpful retail plan, and a sample ad, for use in billboards and such.) “In fact, the retail model would still work even if they sold it right next to the direct sales that I provide in my shop. 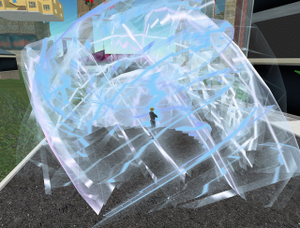 In a virtual world where teleportation is possible, location must not determine whether a sales model will succeed or fail.” With a month on the market, he’s sold far in excess of a hundred units. Retail as a way to build a better world, in other words.